Playing with some colours in my sketch. Here showing more of the image you can see I have added another friend for my Singularity lady. 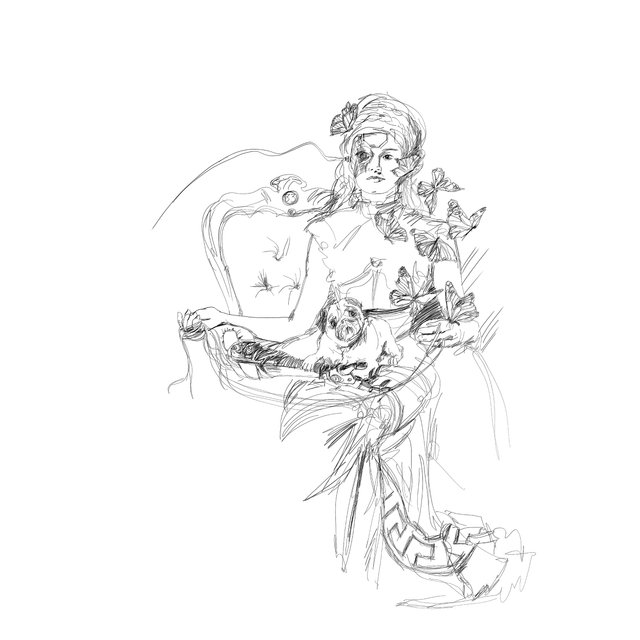 Here is just the sketch of her new companion, though he hasn't received any colour as of yet. I love to do studies in pencil later adding watercolour when planning a painting. Sometimes the process will give me ideas of more inclusion of other things. This, of course, leads to me adding and adding and trying to decide when to stop. Knowing when a piece of Art work is done has always been an issue for we artists. Another reason I do enjoy my black and white drawings and my more graphic pop colour pieces, as they have a very definitive end to me. This is also why I have accepted this year that my Singularity paintings will take some time and will be done after some time, but I am going to be open to their desire to have more and more added. I've always loved artwork with narrative. The more symbolism and hidden bits and pieces the more I've loved it. As a child at museums looking into the highly filled works of the past was like watching a favourite movie for me. Pulling one in and imagining the world depicted there in. I hope all of you have a good day of indulging your artistic passions. Do you find it hard to know when a piece is done? Oh, well. And now this pleasure in colors... Great! Lovely light washes enhancing your drawing beautifully Donna. Thanks @princessmewmew yes she needed another companion to watch over her. 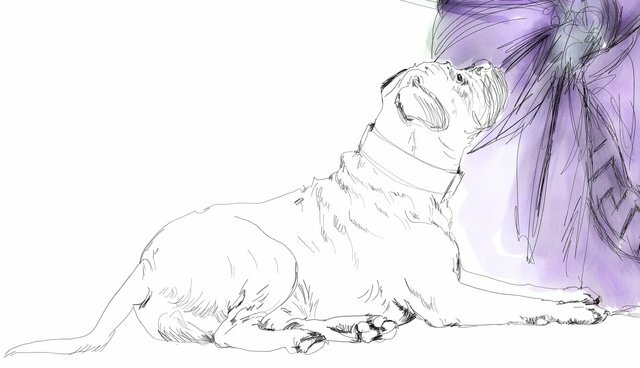 It sure amazes me how you can just 'draw up' a new pooch with such realism in a work. Amazing indeed. And I like both the BW and addition of color. They are totally different animals of the same nature. As for art...I'm pretty sure a piece is never really done. I've just had to accept that it is up to that point, and put it out. Steemit has been good for that, as I'm sure I've mentioned ad nauseam. Or at least now and then to a large degree. There is a timeline here, if not a bit self-imposed (otherwise, I'd have a site with only 3 posts, vs. 270 or so, still a small # by most accounts). But that is also the joy of all of this. I love the layering in any art work. And as you say above, adding the bits and pieces, is so fun, and increases the depth, meaning or effect of a piece over time. 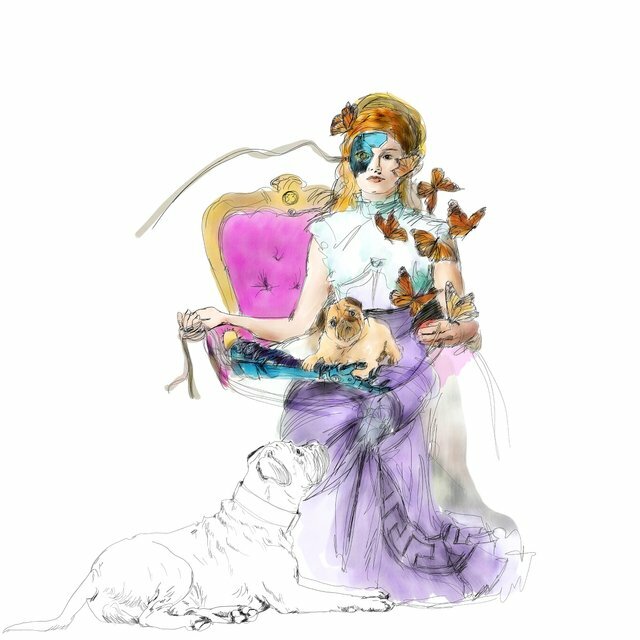 Added details of idea that come forth later on. After all, you can't think of EVERYTHING at that one moment. I call it layering in writing. That's why the Steemit model is good, and not so good. If you can let something 'sit' over time, and ruminate on it, or, better yet, walk away and do other things, then come back to it a week, even months later, then add more. Details and other additions or humor can be added as it 'sets up'. Does that make any sense? Though it is important to get the initial skeleton up and running, as so much of this is momentary, shoot from the hip if you will, and if you don't get it down, it may be gone forever. Wow, I sure can babble away with my hands here!! You always seem to toss some pretty hefty handfulls of thought kindling on the fire of discussion. Thanks for that, and have a nice day. So beautiful piece! I love your artwork with animals and this one reminds me a lot of positive thoughts ❤️ Happy Valentine's day! I enjoy watching how you put images together in sequence. It really can be a challenge to find the balance of 'finished' @georgeboya and I know I struggle with it often.